The Men's Interstate Championships were scheduled for Lake Wendouree but drought conditions prevailed and there was far too little water in the Lake to conduct the Championships. The Championships were also a key part of the selections for the 1968 Olympic Games. Heats, repechage and final were again employed. This was the first year of the women's lightweight four oared event. The trophy was presented by the Victorian Ladies' Rowing Association and much credit for its introduction can be given to Margaret Mackenzie (nee Agnew). It was therefore fitting that the first winning crew was stroked by her. This was a tightly contested race between NSW and VIC with little between these two crews all the way down the course. This was the first win for Kert of Queensland and the first Interstate Championship for Queensland since 1939. Reddell was selected ahead of the reining Champion Shirlaw by defeating him at the State Championships. NSW was in second place for most of the race but won on the line with a strong finishing sprint. 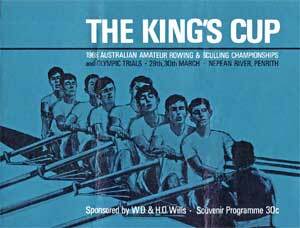 The Fours Championship was a strong 2 1/2 length win to NSW who lead all the way. Heats and a repechage were used in this event. 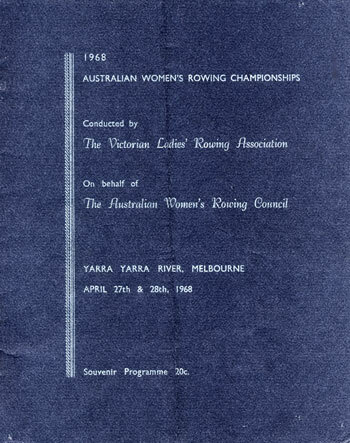 Margaret Clarke of NSW won the Sculling Championship by only one length from Alison Thorne of Victoria who struggled with her steering, nearly hitting a bridge. The Lightweight Four Championship was an easy win to Victoria.